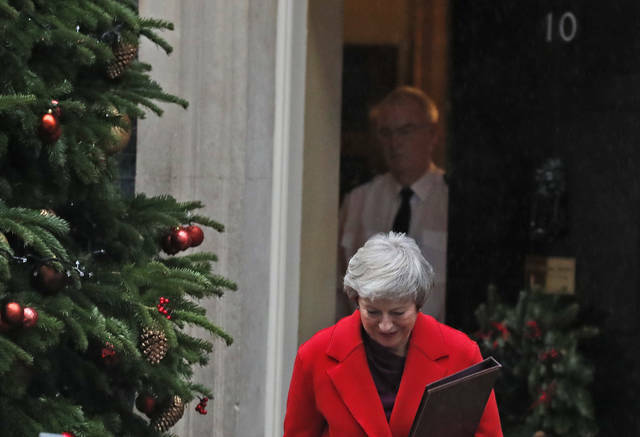 May is battling to persuade lawmakers to support the divorce agreement between Britain and the European Union in a Dec. 11 House of Commons vote. Opposition parties say they will vote against it, as do dozens of lawmakers from May’s Conservatives. Defeat would leave the U.K. facing a messy, economically damaging “no-deal” Brexit on March 29 and could topple the Conservative prime minister, her government, or both. “My job is making sure that we do what the public asked us to: We leave the EU but we do it in a way that is good for them,” she told broadcaster ITV. 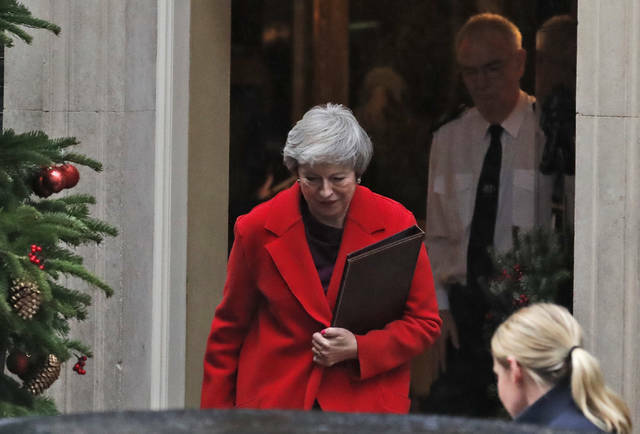 May has consistently refused to say what she plans to do if — as widely predicted — the British Parliament rejects the deal she reached with the EU. “I’m focusing on … getting that vote and getting the vote over the line,” she said. Politicians on both sides of Britain’s EU membership debate oppose the agreement that May has struck with the bloc — Brexiteers because it keeps Britain bound closely to the EU, and pro-EU politicians because it erects barriers between the U.K. and its biggest trading partner. May’s opponents on both sides argue that Britain can renegotiate the deal for better terms. But the British government and the EU insist that the agreement, which took a year and a half to negotiate, is the only one on the table, and rejecting it means leaving the bloc without a deal. Rutte cited “red lines” drawn by both sides during the negotiations, including the U.K.’s refusal to accept the free movement of people between Britain and the EU, and the need to keep an open border between the U.K.’s Northern Ireland and EU member Ireland. “When you take all these red lines into account, it’s simply impossible to come up with something different than we have currently, the deal on the table,” he told The Associated Press on the sidelines of the global climate conference in Katowice, Poland. Frank Jordans in Katowice, Poland contributed to this story. Ghosts of European colonialism still haunt us today even in the 21stcentury. This was evident from the untimely death of American John Allen Chau, 26, from Washington state on November 16that the hands of Sentinelese-Jarawa people from the Andaman Islands. The last days of Mr. Chau are reminiscent of the novel At Play in the Fields of the Lord(1965) by late naturalist, Peter Mathiessen, where everything goes wrong for the Christian missionaries, as they did for Chau. This young American was naively determined to eradicate what he called “Satan’s last stronghold” in the world and paid for it with his life. There are only about 100 Sentinelese-Jarawa people left. They are fiercely independent, rejecting contact with outsiders and culturally remaining intact. Jarawa are small-statured and ebony-complexioned and thought to be remnants of people who originally migrated thousands of years ago from Africa and settled in the Andaman Islands east of India and west of Myanmar. For the most part, the Indian government has been successful in preventing interlopers from accessing their island. Chau paid some local fishermen to reach these remote Jarawa people. As these tribal people have managed to remain isolated, they are also highly susceptible to viral contagion, even from the common cold and flu. We may begin with the Abrahamic religions’ origin story of Adam and Eve, who bit from the forbidden fruit of knowledge in the biblical Old Testament and were ejected from Eden by Yahweh. The symbolism is fairly clear. The Garden of Eden represents idyllic nature, the millennia when humankind spent hunting and gathering until the Neolithic Revolution about 12,000 years ago with the domestication of plants and animals. This was the so-called transition to civilization, eventually producing states, writing, hierarchies and class systems, organized religion, slavery, mass warfare, science, astronomy, mathematics, and genocide. It was a knowledge supposing humankind was somehow separate from nature and humans were superior to nature—at least to Western minds in the Judeo-Christian tradition. What is more, in the “Age of Exploration,” Europeans believed they had to “civilize” non-Western people and bring them God’s word and convert natives to European ways. As such, along with killing and torturing natives, Europeans made it a practice of saving indigenes from their supposed state of nature, ignorance, and savagery. When the Portuguese first landed in Brazil in 1500, Pêro Vaz de Caminha wrote King Manoel I: “They seem to be such innocent people that, if we could understand their speech and they ours, they would immediately become Christians. For it appears that they do not have or understand any faith…”Salvation of natives indeed became one of the primary projects of the conquest. Unbeknownst to most Americans, Hitler partially based his ideas of the concentration camp and extermination of European Jews on Native American reservations and our racial policies in the United States. Americans systematically conquered original peoples and justified the ensuing genocide with the idea of “Manifest Destiny,” a term coined by journalist John O’Sullivan, meaning the divine right to settle the continental United States from “sea to shining sea.” The Natives were just part of the natural landscape and in the way. “Civilization” is an ambivalent outcome at best for indigenous peoples. At this late date, it is likely that we can learn much more from them than the reverse. After all, their lifeways would sustain for unknown millennia, whereas climate chaos, nuclear annihilation, resource depletion and contamination—products of conquering empires—are supplanting genocide with societal suicide. Time to listen instead of preach, time to slow down, consume much less, and respect all peoples and our planet. J. P. Linstroth earned his PhD from the University of Oxford in Social and Cultural Anthropology and is a former Fulbright Scholar to Brazil. He is author of Marching Against Gender Practice: Political Imaginings in the Basqueland. Are computers in the classroom more helpful to students – or the companies that sell the machines? Disclosure statement: Kate M. Miltner does not work for, consult, own shares in or receive funding from any company or organization that would benefit from this article, and has disclosed no relevant affiliations beyond their academic appointment. Partners: University of Southern California, Annenberg School for Communication and Journalism provides funding as a member of The Conversation US. Cuban found that some educational technology initiatives from the 1990s did help students get access to computers and learn basic skills. But that didn’t necessarily translate into higher-wage jobs when those students entered the workforce. However, the equipment and software needed to teach them brought large windfalls for tech companies – in 1995 the industry was worth US $4 billion. Editor’s notes: This is an updated version of an article originally published Dec. 4, 2017.